We are so excited to reveal our latest local project. It is our first ever of this sort. A big girl's room! Our client is the most darling little girl, we shall call her E, and she only deserves the most darling space to foster her creative spirit. Our client has a bedroom with a bonus room space attached. We wanted to make this a fun and exciting space where E and her girlfriends can gather and have a great time. Within 5 minutes of meeting with our client, we knew exactly what they had in mind. This little girl knows style! You know when you sit down with a 9 year old and she says she wants a pagoda chandelier, girl knows what's up. She knew she wanted bright colors and high fashion. Her wish, is our command. Let's start with the seating. We wanted to create seating at a relatively low cost for E and her friends. Our suggestion was to have 4 20'x20' floor pillows made with a turquoise quatrefoil fabric that we had already purchased for the space (not seen here). With those pillows, we decided that hot pink cording was a necessity. In addition to the seating, we found a steal at our local Habitat for Humanity. This is the perfect addition for the desk. We suggested to have that painted a distressed white shade and then upholstered with the turquoise multi colored stripe fabric (seen as a pillow on the board). This will be a simple DIY project and we think will be an adorable addition to the space. Obviously an overstuffed chair is a necessity in this fun space. We see it perfect for reading and lounging. As far as a desk goes, we found this amazing turquoise piece that is sure to turn heads. It is extremely affordable given the design and style of it. We absolutely adore it for the space. Our client was big on storage. In effort to create affordable, functional storage, we think the best option would be line the walls with the Target-ish cabinets in white and then paint the backs of the cabinets a bright pink. We even thought maybe adding a little trim to the top, might be a fun addition to make the pieces look more custom. We figure we can really jazz the plain and boring modular shelving up. On to the accessories. 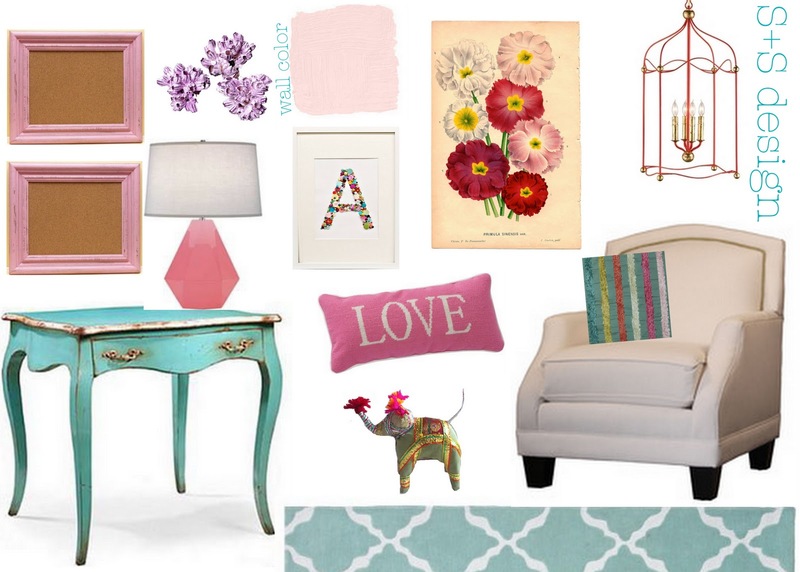 We included a few options for fun pillows to add splashes of color to the room. Also, we adore elephants and think they are a fun and lively addition to E's play room. Lighting! We were lucky enough to find an old brass chandelier at a local rehab store that we are planning to turn into our very own pagoda chandelier. We decided to go with a bright pink to contrast the light pink walls. As for the desk lamp, every little girl needs a hot pink desk lamp. Don't ya think? Wall coverings. As we mentioned, E is a super creative and bright little girl, of course she needs pinboards to display all of her fun notes and drawings. This could be a simple DIY project. Just find decorative frames, add the cork and some paint and voila! Super easy. We loved the idea of super feminine artwork. We had been obsessed with the idea of making button art with her initial, E. You will see the example in the design board. All you have to do to recreate this look is get a mish mash of random buttons and glue them on to a pretty sheet of linen and frame it. We have also kicked around some other ideas about creative DIY art in the room. Framing E's art, printables. List goes on and on. What do you all think? We are kind of jealous of her own little space. We cannot wait to pull it all together. Very cute combination - love the turquoise! For accessories. We included several options for fun pillow to add a splash of color to the room. Also, we adored the elephant and think they are fun and lively addition to the playroom E. Illumination! We were lucky enough to find an old brass lamp in a local rehab store which we plan to turn into our own pagoda lamp. We decided to go with a contrasting bright pink to pink walls. As for the table lamp, every little girl needed a pink table lamp. Do not ya think? thank you for article i like your post nice post..
En cuanto a la oficina, nos encontramos esta increíble pieza de color turquesa que es seguro para llamar la atención. Es muy asequible debido al diseño y el estilo de ella. Adoramos en todo el espacio. Nuestros clientes fue un gran almacén. En un intento de crear una, almacenamiento arte asequible, y creemos que la mejor opción es la línea de las paredes cara daftar bbm telkomsel con la jerarquía gabinetes gol en pintura blanca y luego aparecieron los tanques de color rosa brillante. Incluso pensó que tal vez añadimos un poco de ajuste en la parte superior, puede ser interesante también para que las piezas parecen más personalizado. Decidimos que puede realmente jazz, simple y aburrido hasta estanterías. Thanks for this helpful information. Keep up the good work! thanks, its help me to get back my lost data..
Hi there everyone, it's my first go to see at this web page, and article is really fruitful in support of me, keep upposting these articles. nos encontramos esta increíble pieza de color turquesa que es seguro para llamar la atención. Es muy asequible debido al diseño y el estilo de ella. Adoramos en todo el espacio. Nuestros clientes fue un gran almacén. En un intento de crear una, almacenamiento arte asequible, y creemos que la mejor opción es la línea de las paredes cara daftar bbm telkomsel con la jerarquía gabinetes gol en pintura blanca y luego aparecieron los tanques de color rosa brillante. Incluso despacito pensó que tal vez añadimos un poco de ajuste en la parte superior, puede ser interesante también para que las piezas parecen más personalizado. Decidimos que puede realmente jazz, simple y aburrido hasta estanterías. Akun LINE sengaja dihapus nanti untuk menggunakan LINE lagi perlu melakukan registrasi ulang atau membuat akun baru, Cara masuk aplikasi Line, kemudian LANJUTKAN dan masukkan HP aktif Anda saat ini dan menggunakannya pada HP. Very beautiful, look womenly :D I like it. Really good article, very helpful and add to the knowledge of weight health. Come on ... click my web about acne treatment and skin health. owe the more you get it seems.